Finally Kanebo changed the formula of Allie in 2018. Allie Moisture Gel is now Kanebo Allie Extra UV Facial Gel. Hazelnuts of Philippines bought Allie Extra UV Facial Gel. Let’s see how she felt. 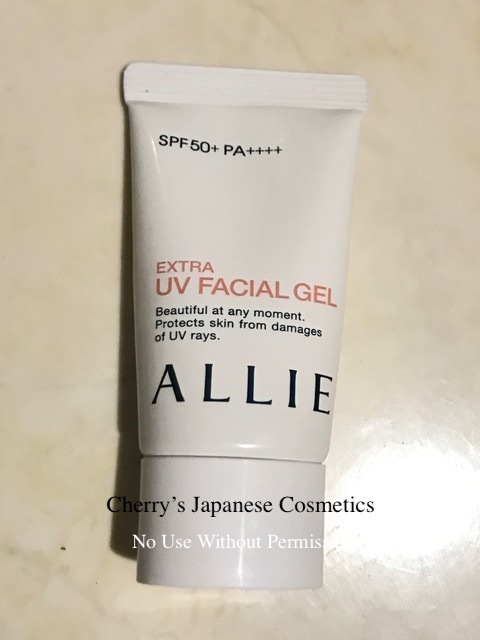 This is a post about another sunscreen from Kanebo, the Allie Extra UV Facial Gel. I previously tried the UV Extra BB gel, which was very good, so I have high expectations on this one. I am quite used to milky, watery textures for my sunscreen products, because of the humid weather in my country, so I am quite curious with other sunscreen formulas. As this is a facial gel, upon application it has a rather thick, watery, bouncy texture that is more moisturising. I find that when I apply this, it goes on slightly sticky/tacky on my face, and provides enough moisture that is sufficient enough for my combination skin. I use this product in the morning as my primer/moisturiser in one. It has no scent, and it settles fairly quickly, without any white cast. It absorbs easily as well. My powder foundation glides on smoothly afterwards. Aside from the initial application, this product feels fairly lightweight on my face. It also did not cause any breakouts. I do not feel the need to reapply even when I sweat. My makeup and sunblock stayed intact even after long hours in a humid environment. It’s also easy to remove, with makeup remover and cleansing water. I wash my face afterwards with facial foam. Overall I really like this one because the gel texture provides moisture and serves as a real good primer for my face. It is a good sunscreen especially when you perspire a lot. I will continue to use this because of its texture and adequate sun protection. Hazelnuts used this sunscreen as her foundation primer. I often do that when the foundation has less sunscreen effect. I often sweat a lot, and regularly primers have less sunscreen effects, but these sunscreens for faces, even these affordable Allie or Anesssa have waterproof or water resident effect. It is important for me. Check the latest price, and order from here; ” Allie Extra UV Facial Gel“.